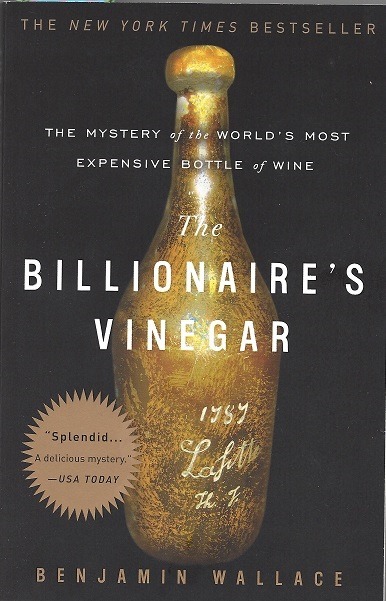 This entry was posted in Whimsy, Wine Making, Winemakers, Winemaking, Words, Writing and tagged Billionaires, Fraud Wines, Wine Making, Wine Worlds, Writing. Bookmark the permalink. I agree, Robert. My wine is purchased to be enjoyed – even moreso with Naked Wines giving me the opportunity to personally know and interact with the winemakers​. Thanks for the lead on the book – I hopped right out to load it onto my tablet. And while there, found Bill Bryson’s English and How It Got that Way – sent a hard copy to my other-mother and an e-copy to me! When we first moved to California years ago, people were talking about the newly minted dot com bazillionaires who routinely drank $3000 bottles of wine at dinner in local restaurants. I recall one such new high roller being quoted as saying he didn’t even care for wine, but ordered $3000 bottles with his supper because he could. I’m grateful you’re here for the rest of us, Robert. I drive cars that don’t cost that much. I grew up with Bill Gates and know his family well. he wouldn’t waste the money on any wine. He’d spend the money trying to wipe out Polio. You should read the book, I think you would enjoy it and marvel at the excesses of our world. It’s almost enough to make me vote for Bernie Standers for President. I’m sorry if I offend on either side of the political scale, I was just trying to make the point that we could take care of a lot of folks and create a lot of jobs if we didn’t waste our wealth on folks with no common sense. I agree with you, and you didn’t offend. I am, after all, a Bernie supporter myself. #FeeltheBern! I am also, though he is a little too conservative for my taste.